Easter Eggs have been a part of my life since I was a small child. I can remember looking for eggs with my brother ... typically plastic ones filled with candy ... and later egg-shaped jelly beans or wrapped chocolates. I remember coloring eggs with our mother and, more recently, doing the same with my own daughters. Growing up, I think the Easter Egg symbolized treasure (candy) and new beginnings (chicks emerging). Today, at Unity of the Seacoast (Dover, NH), parts of the music and the ministers' talk were focusing on the tomb. The stone was rolled away and Jesus' body was gone. He was Resurrected. I began to see the Easter Egg as so much more, and I'll never look at an egg in the same way. Jesus' life showed us how to walk this human path in light and love. His Resurrection was a gift; it showed us that death truly is not the end. Yes, the physical form or space suit for our life on this planet expires, but we do not. Our loving soul is eternal and lives on. 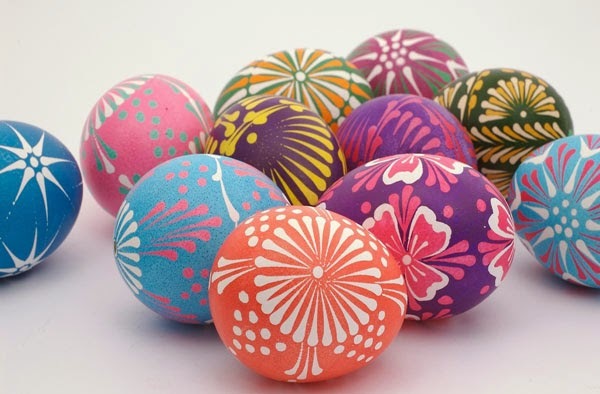 The Easter Egg (or any egg, actually) can be symbolic of "the tomb" ... inside is the Christ Consciousness each of us is able to express while we are alive in physical form. While we may have become really entombed under previously-accepted limitations on who or what we CAN or CANNOT BE, we also hold the key to our own escape. In each and every moment, we can roll away the stone and emerge. We have the opportunity to break out "of our shell" and express the love we are at our core. We are offered time a freedoms not readily available to prior generations, who had to toil physically for many of their hours of existence. We can be fully aware of ourselves as spiritual beings expressing through physical form ... not held down by the restrictions of the physical form ... but expanding what it means to BE IN physical form! I believe that is why we are here at this time. Discovery of SELF can be as easy as shifting our focus, from what we need (materially or spiritually) and what we aren't, to what we already are. Sit for a moment and contemplate what treasure lies within your self/egg/tomb. Know that you have something unique. You brought a note that only you can sing ... a thread that only you can add to the tapestry that connects us all. Even if you've yet to find it, it's there! Bring your attention to your heart. Fill yourself with love and gratitude for the chance to be here. Then ask to be shown the path back to SELF and your gift. Be sure to take the time to listen for the answers.Watch for sign posts ... and remember to let yourSELF out each time you see an egg! If you keep your focus on that feeling of love and gratitude and not on worry and fear, what shows up will be so much more than anything you could have accomplished by trying to be more.